This Research Guide provides information about Hip-Hop Collections in the Healey Library at UMass Boston and provides researchers with information about doing research about hip-hop more broadly. 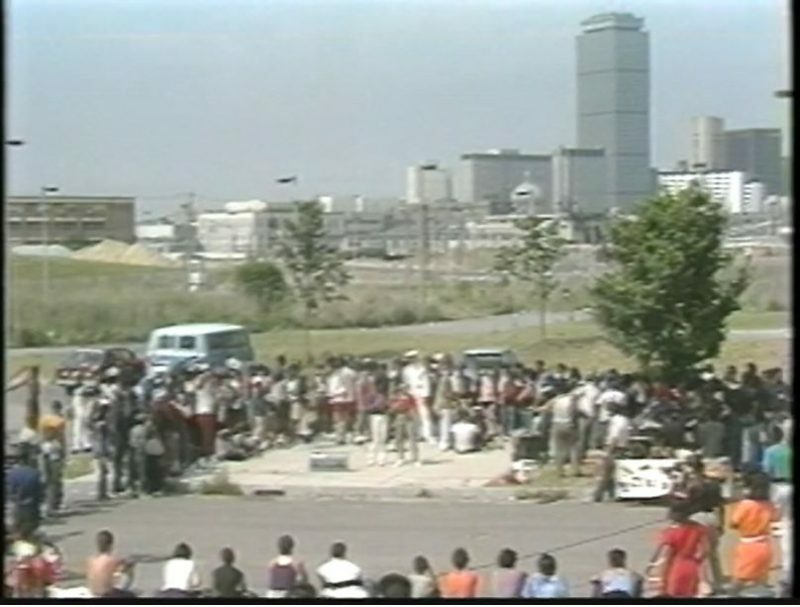 Screenshot from the documentary film, “Breakin’ Rappin’ Poppin’ and Graffin’” (1985). In 2016, University Archives & Special Collections in the Joseph P. Healey Library at UMass Boston launched the Massachusetts Hip-Hop Archive with an initial donation by Pacey Foster of recordings from the Lecco's Lemma radio program, a local rap music show that was founded by Magnus Johnstone and ran from 1985 to 1988. The Lecco's Lemma collection contains nearly 300 demos by local artists that were given to Magnus, as well as nearly 200 recordings of the show made by Willie "Loco" Alexander. As we continue to develop this new collection area, we welcome donations of archival materials from musicians, DJs, break dancers, graffiti artists, producers, promoters, and fans that will help us document the rich heritage and legacy of hip-hop culture in Boston and Massachusetts. Click here to learn more about contributing materials to the collection. Browse hip-hop-related articles on our online newsletter, Open Archives News. Subscribe to our newsletter here to receive notifications of newly-processed collections. Contact us at library.archives@umb.edu if you have hip-hop materials that you would like to donate to us. Explore all of our archival and manuscript collections that document the history of hip-hop in Boston. To access collections held outside of UMass Boston, search ArchiveGrid, WorldCat, and the Digital Public Library of America. Search for "hip-hop" and related keywords. Lecco’s Lemma Collection: Lecco’s Lemma was a local rap music radio show founded by Magnus Johnstone that ran from 1985 to 1988 on local college radio stations WMBR (88.1 FM) and WZBC (90.3 FM). The Lecco’s Lemma Collection contains both artist demos that were given to Magnus, as well as recordings of the show made by Willie “Loco” Alexander, who regularly taped the show throughout its run. "Show 'Em Whatcha Got" Mass. Memories Road Show: The Hip-Hop Edition: More than 200 community members joined us at the Boston Public Library on Saturday, May 19, to share photographs, objects, and memories at “Show ‘Em Whatcha Got” Mass. Memories Road Show: The Hip-Hop Edition. In all, we collected about 300 digital images of items ranging from photographs and concert posters to t-shirts and album covers. We also recorded about 60 video interviews with community members. This digital collection will be available online soon. Available Online Soon! Massachusetts Rock Against Racism: Massachusetts Rock Against Racism (RAR) was co-founded in the Boston area in 1979 at a time when the City of Boston and its surrounding areas were “rocked by racism.” The RAR organizational records are part of University Archives & Special Collections at UMass Boston and we recently completed digitization and description of approximately 100 videos from the collection, thanks in part to a grant from the UMass President’s Creative Economy Initiatives Fund. This digital collection will be available online soon. View “Breakin’ Rappin’ Poppin’ and Graffin’: A Rockumentary” from this collection, which was filmed at Madison Park High School in Roxbury, Mass., on June 9, 1985. Among other performances, the footage includes a breakdance battle between the Floor Lords and HBO. Available online via JSTOR (Access restricted to authorized UMass Boston patrons). Search UMBrella for books about hip-hop. Try searching for keywords like "hip-hop," "hip hop," etc. As its name implies, the Garland Encyclopedia of World Music Online covers music from all around the world. It examines the many aspects of ethnomusicology such as a place’s musical heritage, cultural groups, musical genres, practices, and performances. It includes many illustrations of instruments, musicians, maps, performances, and snippets of music pieces. It is further enhanced by audio samples of of music from each area of the world. RILM (Répertoire International de Littérature Musicale) provides in depth international coverage of the field of music. It indexes a great variety of materials including articles, books, bibliographies, dissertations, films and videos, concert reviews and recording notes. In order to be included the item must have scholarly value. Search these video databases for "hip-hop" and related keywords.